Sunny is a puppy in training with Can Do Canines (www.can-do-canines.org), a non-profit who trains assistance dogs and places them with people who have disabilities, free of charge. 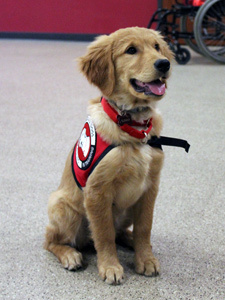 Sunbelt proudly supports Can Do Canines. We share a common belief that when you help people good things follow. Sunny is currently being raised by a volunteer Puppy Raiser who’s teaching the young golden retriever basic obedience and how to behave well in public. After Sunny reaches about 18 months of age, she will return to Can Do Canines facility for final training where her skills will be assessed and refined. She will then be partnered with a person with a disability to help them live a life of increased freedom, independence and peace of mind. Sunny has been adopted by the Sunbelt team as an honorary Business Broker. We are proud to have her on our team and to be able to support the important work that Sunny, her fellow assistance dogs and the people at Can Do Canines do every day to help people with disabilities.